Futbol Club Barcelona is a Spanish professional football club, based in Barcelona, Spain. They play in La Liga, and is one of the only three clubs to have never been relegated, along with Athletic Bilbao and rival Real Madrid. They were founded as Football Club Barcelona in 1899 by a group of Swiss, English, and Spanish footballers led by Joan Gamper, the club has become a symbol of Catalan culture and Catalanism, hence the motto “Més que un club” (English: More than a club). FC Barcelona is the second most successful club in Spanish football in terms of overall trophies, having won twenty-one La Liga titles, a record twenty-five Spanish Cups, nine Spanish Super Cups, and two League Cups. It is also one of most successful clubs in European football, having won ten UEFA competitions. A traditional shot stopper goalkeeper Victor Valdes is not. In 10 champions league games he has had to make 15 saves his shot to save ratio is 65%. Futhermore has kept 3 clean sheets and conceded 8 goals. In comparison Edwin Van der sar has made 9 apperances in this seasons champions league keeping 6 clean sheets and has only conceded 3 goals whilst playing on a team that averages far less possession. 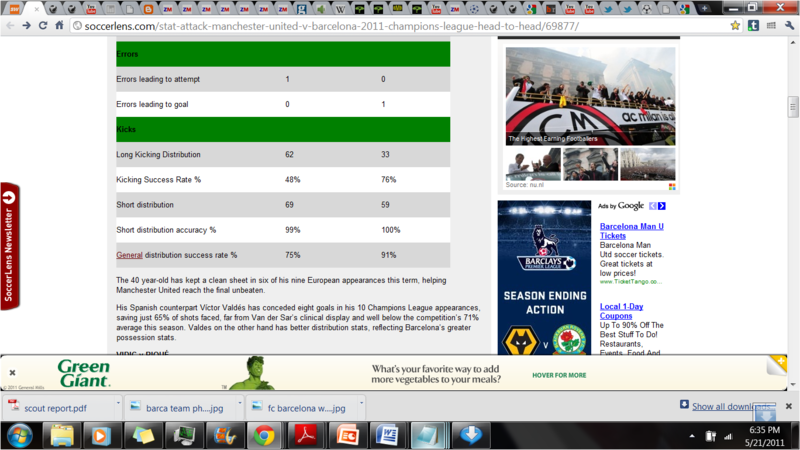 In addition Van Der Sar has made 31 saves and his shot to save ratio is 91%. Victor Valdes may not be a very good traditional goalkeeper like Edwin Van Der Sar but he is the type of goalkeeper Barcalona needs. What he lacks in shot stopping he makes up for with his delivery. If we do the Van Der Sar – Valdes Champions league comparison again we see that Valdes is far superior in his distribution of the ball than VDS. Lastly Valdes offers something that alot of keepers dont he can function as a sweeper. Valdes is comfortable both on the ball and outside the box; this benefits Barca greatly since they use a very high line which leaves them vulnerable to the counter. Abidal is back after having his liver tumor removed. He may not be fully fit but word is that he will play in the champions league final. Abidal occupies an important role defensively. He can play as a centerback equally as well as he can play left back.Also Abidal does key defensive work on the left averaging 2 tackles and interceptions a game. In games against high up wingers he will stay back to form a back 3 which allows Alves to maraud forward. 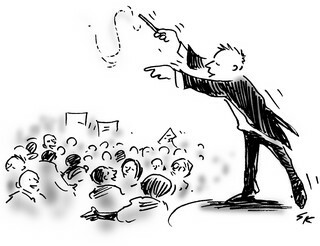 In other games when he has no direct opposition he will go forward him self. He doesn’t offer as much to the attack as he does to the defense though. In attack he averages a key pass every 3 or 4 games and completes a dribble on average once every 2 to 3 games. Abidal is very composed on the ball even whilst under pressure he doesn’t boot it up the field; instead he will play past his pressing opposition to help Barca keep possession. Barca’s midfield three is very unique in that they all have great passing ability; none of them have a pass completion rate below 90% and they all actively help Barca in the build up play. 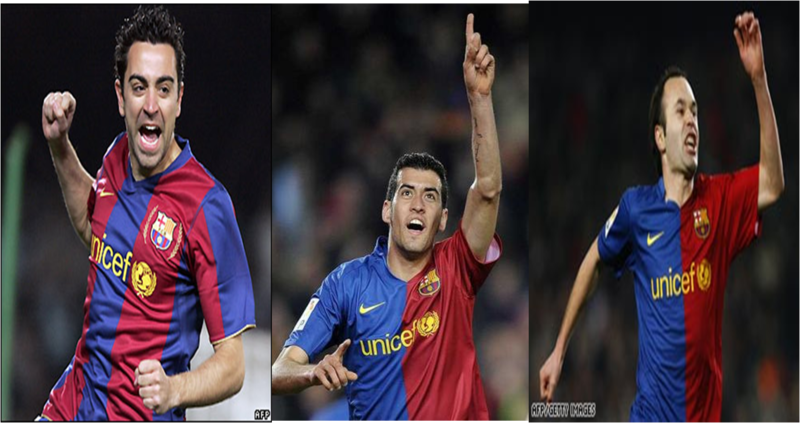 Barca’s midfield is composed of Xavi, Busquets, and Iniesta. Although similar they each perform their own unique task to keep the midfield running and functional. Xavi is the facilitator in midfield; he is the Club’s best passer averaging a 94% pass completion ratio. Furthermore he plays more key passes than any one on the team; averaging 2-3 key passes a game. To add he averages an 121 touches a game in comparison his united counterpart Carrick who has averaged 94 touches per game in the champions league. Busquets operates closer to the back line and is the more defensive of the three. He averages 2-3 tackles a game whilst Xavi averages 1 and Iniesta averages 1-2. Furthermore he leads the clubs with 3 interceptions a game whilst Iniesta averages two and Xavi only averages 1 interception game. Finally Busquets averages 1-2 fouls a game, Iniesta averages 1, and Xavi averages a foul every 5 games. These roles aren’t strictly adhered to though. Some days Iniesta and Busquets will orchestrate the midfield as much as Xavi, and other days Xavi will be the one going forward and getting a goal. Villa and Pedro are different players but occupy the similar roles. Villa is a striker turned into an inside forward whilst Pedro is a winger made into an inside forward. 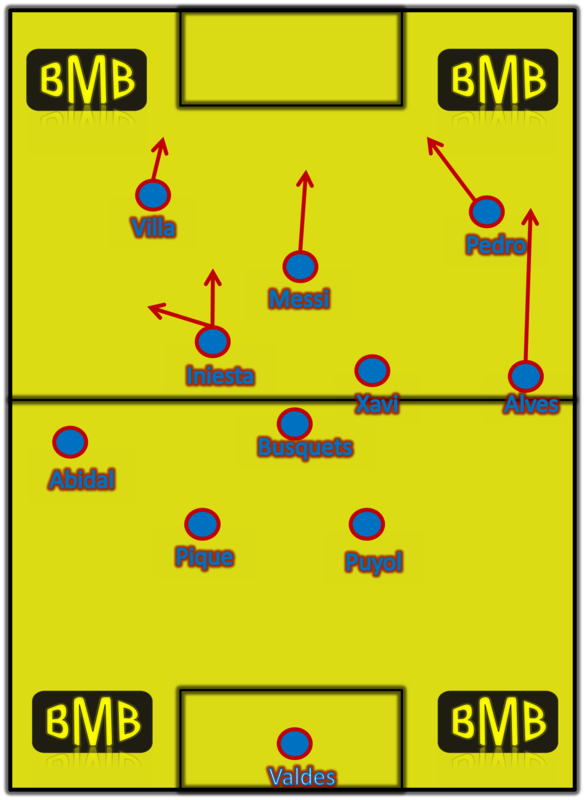 This is evident in games; Villa often starts in a more advance position in between the oppositions right back and right center back whilst Pedro starts out more as a right-winger but cut’s inside. In addition Villa’s higher position means he rarely drops into his own half in the defensive phase of play while Pedro in his winger starting position is usually more inclined to drop deeper. Pedro drops back farther and more often than Villa. Villa usually occupies the position in between rb and cb. Pedro stays on the flanks a lot more and moves inside. Villa’s position means he is in a better positions to shots and thus naturally get more goals than Pedro. Villa averages 3 shots a game while Pedro averages 1-2 shots per game. Statistically Pedro might just be the more clinical of the 2 he has a goal average of .54 whilst Villa has a goal average of .56 but Pedro is alloted less goal opportunities during a match. Both Pedro and Villa are fast and possess the ability to break through the back line, but Villa is poor when it comes to holding his runs and he averages more offsides than any one on Barcelona. Villa averages 2 offsides per game whilst Pedro, Messi, and Alves average an offsides every other game in La Liga. Barcelona are a very balanced team. Their goalkeeper Valdes matches their style of play very well. Pique balances Puyol’s aggressiveness. Abidal balances out Alves’s constant need to get forward. The midfield trio all work together to perform vital jobs in the middle. Messi’s is dynamic and unpredictable and gives a surprise element in their routine passing approach. Even Villa and Pedro compliment each other. Villa is the more direct whilst Pedro is more of the winger and creates more. It will be hard for United to break down such a fluent and well rounded team on Saturday.